Home America Now	What’s Going On In Venezuela? Two decades after the election of Hugo Chavez ushered in an era of socialism to Venezuela, things are finally coming to a head. 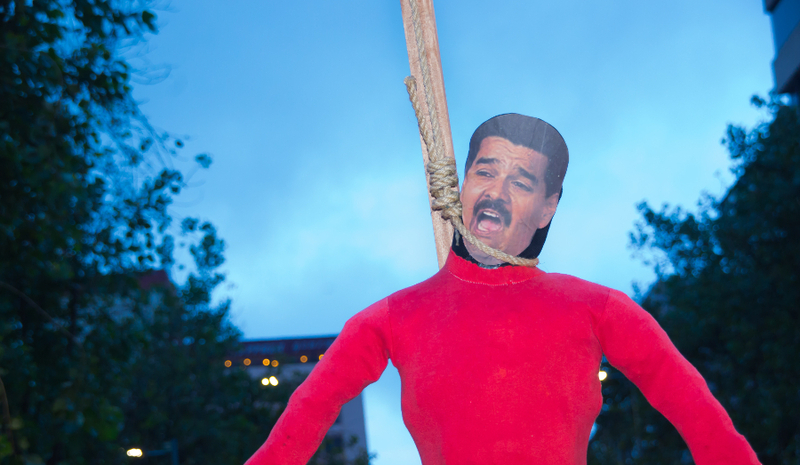 After two years of horrendous hyperinflation that have seen everything from medicine to toilet paper to basic foodstuffs in short supply, the regime of Chavez’ successor, Nicolas Maduro, may finally be coming to an end. With widespread dissatisfaction with his regime throughout Venezuela and having just started a new presidential term after an election that was widely criticized as being fundamentally flawed and undemocratic, Maduro is no longer recognized as the leader of Venezuela by the United States, most South American nations, and much of Europe. But does that really matter? Maduro still has control of the military, or at least of the top generals, and for now that’s vitally important. As long as he can keep the soldiers paid and fed he’ll be able to maintain power and control. He also has the support of Russia, China, and Turkey, all of whom are helping to prop up his government, which otherwise likely would have fallen by now due to its gross financial mismanagement. Venezuela has the largest oil reserves in the world, with nearly 300 billion barrels. But two decades of socialist governance have driven the Venezuelan oil industry into the ground. Nationalization of the oil sector and expulsion of foreign oil companies have resulted in Venezuela’s oil production declining by over 95% from its previous levels. The government over the past two decades has squandered oil revenues, spending lavishly on unsustainable social programs. Now it has turned to printing money to try to accomplish its ends, with the resulting hyperinflation of the past two years reaching inflation rates now of 80,000% or more. It’s a wonder Maduro hasn’t been overthrown before now, given how badly he has mismanaged the country and its economy. Unfortunately the United States has decided to get involved in internal Venezuelan affairs, and has recognized 35-year-old opposition leader Juan Guaido, a relative unknown who was recently elected as the President of the Venezuelan National Assembly, as the true President of Venezuela. That’s problematic, as Guaido wasn’t a candidate in the last presidential election, so his legitimacy rests solely on his recognition by foreign governments. That’s ammunition for Maduro to claim that he’s being ousted in a foreign-backed coup, which seems to be the case. That in turn will be highly counterproductive in getting Maduro out of power. When your opponent is about to score an own goal, you don’t want to steal the ball from him, but that’s exactly what the US has done. Time will tell whether this attempt to topple Maduro will be successful or, like previous coup attempts, it will fail miserably. If the US and other countries don’t have a game plan in place and haven’t thought out what will happen in the post-Chavista era, don’t expect things in Venezuela to get better anytime soon.